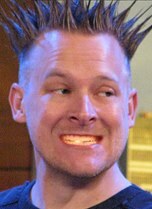 Brian Brushwood will haunt us all, 140 characters at a time. The Bizarre Magician (and full disclosure: my co-host on NSFWshow and the Weird Things podcast) has set into motion a new site entitled AfterLyfe.me whereby his last year of tweets will be relived for eternity should he not activate a kill switch each year on his birthday. In short, once he dies he lives forever in a social media loop. The service will begin to update Brian’s social media accounts like Twitter and Facebook with the past year’s updates. The accounts will update on the same date and time as the original message posted in the final year of his life. Every year from then on will see Brian’s final posts pop up on the same date as the original post. Brian also hopes to add more functionality down the road, including selecting certain favorite messages to post at random times after his death. In such a way he’ll continue to make people chuckle or think or perhaps even weep a little. He’ll be a virtual ghost. Let’s at least hope he works in a few card revelations on Halloween for the rest of us. Don’t be selfish Bri. Posted by Editor on Thursday, January 20th, 2011 at 12:48 pm. That is crazy, creepy and brilliant.